We love good, God fearing people who believe in God and stand up for what they believe, not bowing down to the liberal agenda, not giving in to the dumbing down of our young ones in Public Schools (otherwise known as "indoctrination camps" for the New World Order). We believe in the Constitution of the United States of America, and especially the 1st, 2nd, and 4th Amendments in the Bill of Rights. If these things also describe you, then please feel free to email us and share viewpoints, recipies for BBQ wild game. If you do not share our basic beliefs, then please visit with other people on the Internet. There are hundreds of thousands of folks you can share left-handed, limp-wristed, middle of the road ideas and viewpoints with but that's not us. 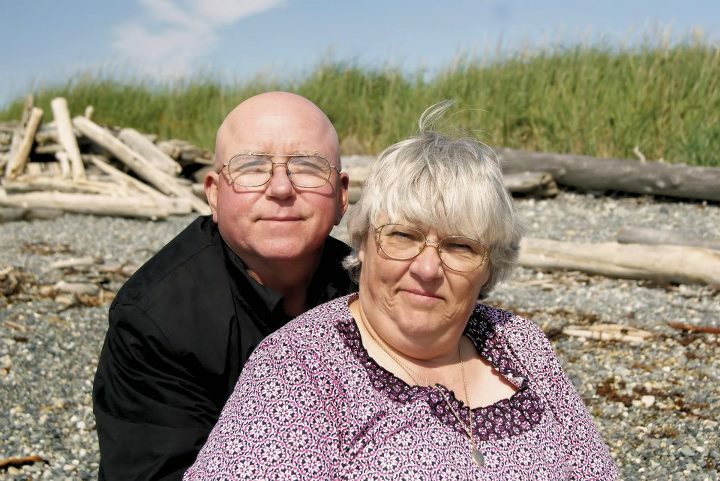 Mr. and Mrs. Oldranger on the beach at Camp Casey Whidbey Island, WA June 2012. The wind was blowing off the water and sun was in our eyes, but joy still abounded.